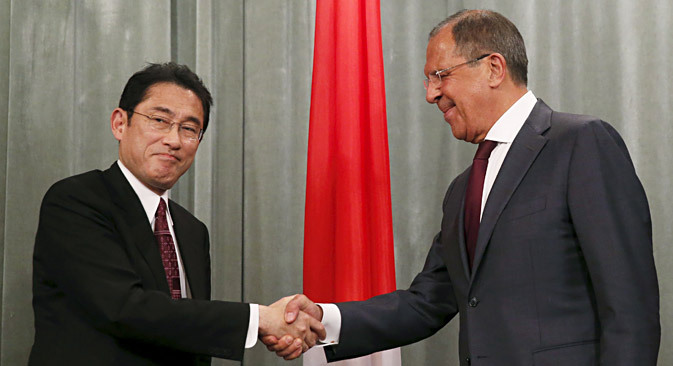 Russian Foreign Minister Sergei Lavrov (R) and his Japanese counterpart Fumio Kishida shake hands as they attend a news conference after a meeting in Moscow, Russia, September 21, 2015. The talks will be held in Tokyo. The next round of deputy foreign minister consultations between Russia and Japan will be held in Tokyo on Feb.15, TASS said, citing Japanese Foreign Minister Fumio Kishida. “Preparations are underway for the meeting of the Japanese and Russian deputy foreign ministers on February 15 in Tokyo,” Kishida was quoted by the news agency as saying. TASS cited a source in the Russian Foreign Ministry previously as saying that the talks would mainly focus on a World War 2 Peace Treaty.